Lighting is often an overlooked aspect of indoor gardening. If there is a noticeable drop in yield, many growers look at their nutrients, room temperature or humidity as the cause. In most cases, the loss in yield is directly due to not keeping a consistent grow lamp replacement schedule. It is important to understand the limitations of DE HPS grow lamps and not buy into the hype that says they will grow effectively for two years. The facts and the physics do not support this statement. 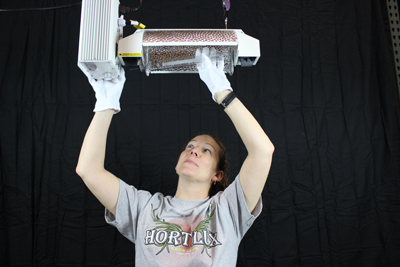 Growers using DE HPS should replace these lamps once every 12 months to maintain consistent yields from crop to crop. Many growers have been told DE lamps will last for two years. This is not true. DE lamps can operate for many, many years but their effective growing window is 12 months when using a 12-on, 12-off flowering light cycle. Growers using light meters to measure Photosynthetic Active Radiation (PAR) in micro moles (µmol) will only see a 5% loss in intensity after one year of use. Since the light meter is only measuring PAR (click here to learn about PAR) between 400 and 700 nanometers, it does not tell you the lamp has lost over 10% of the total amount of light energy produced by the DE lamp. The spectral quality of the light at this point has dropped below its initial ability to produce high yields. To the human eye, the lamps still look as bright as they did the day they were installed. However, the overall amount of light and the quality of the spectrum available to the plants has dropped significantly and this will produce lower yields affecting your bottom line. By the time you see lower yields it’s already past time to replace your lamps. So, remember: 12 – 12 – 12.